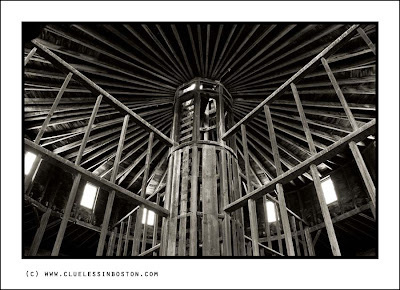 Interior shot of the round barn at Hancock Shaker Village in Hancock, Massachusetts. More monochrome photographs can be seen at Aileni's home of the Monochrome Maniacs. Great b&w. I don't notice any camera shake in the Shaker Village! very very interesting..makes me want to see this barn.. I love the angle and the way you framed this. That structure is amazing. It's a superb shot - I would love to see the barn. Wonderful, functional design that is also a work of art. Great structure with really nice lighting. Wonderful wooden architecture! and the B&W makes it even more beautyful! Wow, this is a beauty. What organic architecture. Is incredible: I remember a huge umbrella! Great structural shot. Old barns are art! As most things old, it's beautifully done. So is the photo. The structure and its framing is beautiful. Great b/w! Really different from my recent barn photo - it's lovely - very unusual structure. What an incredible work of art.. I love wood in all its forms. I'm awed by both the design and construction detail that went into putting this building together.